Certificate to be Given to Volunteers at the Time of their Discharge to Enable them to Receive their Pay, etc. I certify, on honor, that Henry Smith, a Private of Captain White's Company I of the 2nd Regiment of Maine Volunteers of the State of Maine, born in England, State of Great Britain, aged 33 years; 5 feet 9 inches high; fair complexion, blue eyes, brown hair, and by occupation a Laborer, having joined the company on its original organization...mustered in service as a recruit by Captain Boyce, at Bangor, Maine, on the 2nd day of May, 1861, to serve in the Regiment for the term of 3 years; and having served honestly and faithfully with his Company in ................... to the present date, is now entitled to a discharge by reason of Chronic Rheumatism. 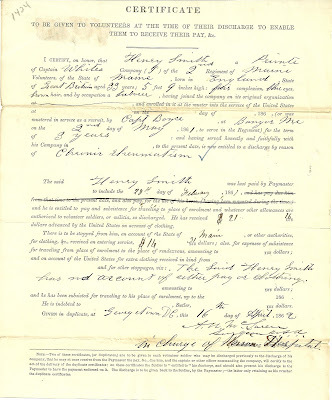 and for other stoppages, viz: The Said Henry Smith has no account of either pay or clothing, amounting to dollars; and he has been subsisted for traveling to his place of enrolment, up to the 186 . He is indebted to , Sutler, No dollars. Given in duplicate, at Georgetown, D.C., this 16th day of April, 1862. Note - two of these certificates, (or duplicates) are to be given to each volunteer soldier who may be discharged previously to the discharge of his company, that he may at once receive from the Paymaster the pay, &c, due him, and the captain or other officer commanding the company, will certify to the act of the delivery of the duplicate certificates: on these certificates the Soldier is "entitled to" his discharge, and should also present his discharge to the Paymaster to have the payment endorsed on it. The discharge is to be given back to the Soldier, by the Paymaster; - the latter only retaining as his voucher the duplicate certificates. 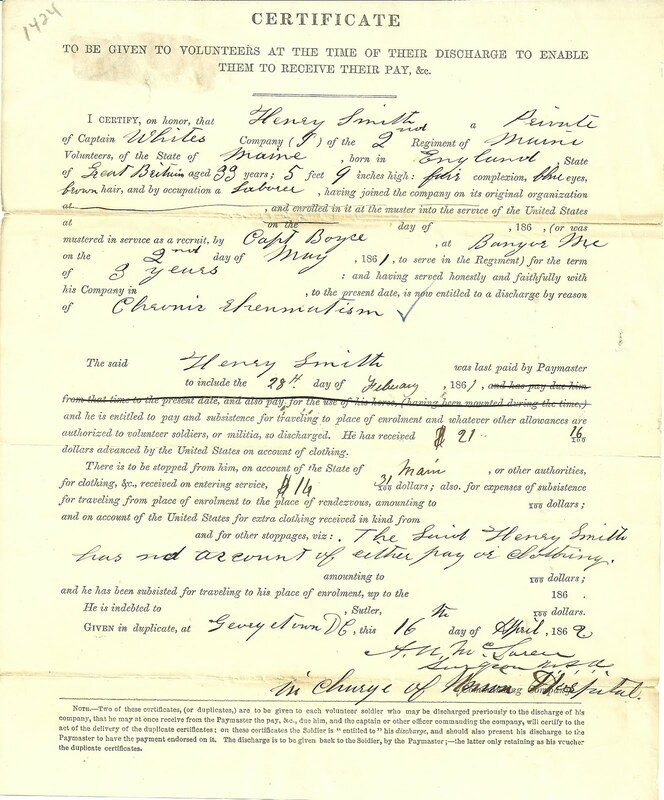 There's a Henry Smith, born in England, living at Milford, Maine, listed on an 1863 registration form of men eligible to serve in Penobscot, Piscataquis and Aroostook Counties. He was a Laborer, as the Henry Smith of the document also indicated. This Henry was born in England, as well, so there's a good chance it's our Henry, but I can't be sure. Perhaps the Henry above was listed here, even though he had earlier been discharged for medical reasons. I couldn't find him in Penobscot County in the 1860 or 1870 US Censuses. Naturally, there are Henry Smiths galore in Maine, but most of them indicated they were born in Maine, not that mistaken information doesn't find its way on the Census form. If you have any information on the Henry Smith who is the subject of this Certificate, please leave a comment. and searching at ancestry for Adam N. McLaren will get a slew of Returns from US Military Posts. Thanks so much for the fast work! I incorporated your information into the blog itself for the benefit of others. Fun to find out Dr. McLaren was a fellow New Englander. And, yes, this is tremendous fun!